If you’ve ever faced an army of dirty t-shirts, socks, and towels spilling from a clothes basket, you know the daunting task that laundry can be. Fortunately, you have an ally in your washer and dryer and the right machines can power through the task and erase every speck of dirt and trace of odor. You’ll save time and have fresh clean clothes ready to be folded and tucked back neatly into closets and drawers. But, if your machine is on the fritz it can start to wreak havoc on your daily routine. When looking at buying a washer and dryer set you might be overwhelmed by all the choices out there including, top loaders, front loaders, stackable, smart appliances, or all-in-one washer and dryers. Each of these comes with a list of pros and cons so its smart to pick the right type for your household. For dryers, you’ll need to decide if you’re looking for a model that runs on electricity or natural gas and sometimes your home's set up might only allow for one or the other. 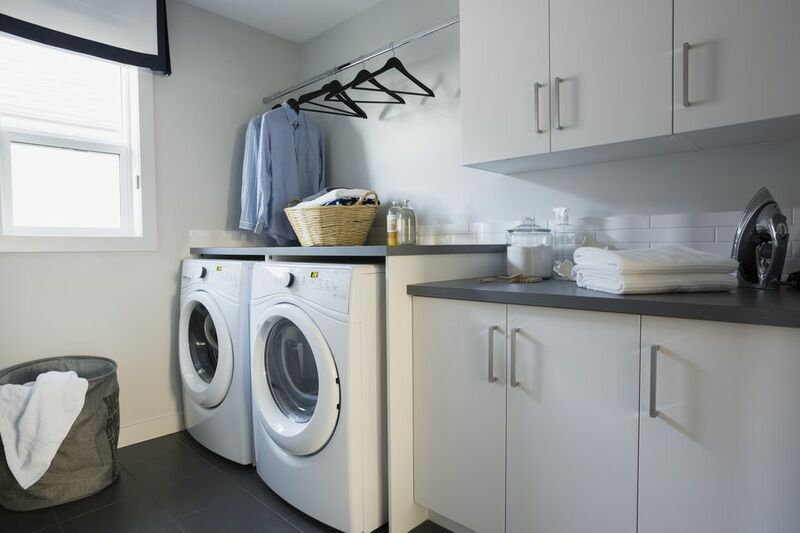 When making the decision on what type of washer and dryer to buy your first thing to keep in mind is how much laundry you typically do in a week, since a smaller capacity machine may mean more frequent loads that use more water and energy. While pricing varies greatly depending on the type of washer and dryer you choose, you can expect to pay somewhere between $1,000 and $3,000 for a washer and dryer set. A set with a top-loading washer and matching dryer will cost less than a front-loading washer and its coordinating dryer. Budget washer and dryer sets can be found for under the $1,000 mark. Capacity: Since overfilling your washer will mean clothes don’t get as clean as they should and underfilling it means a waste of water and energy, you’ll want to find a washing machine with a capacity that matches your average load size. Capacity is usually measured in cubic feet and a standard washing machine typically has a drum with 3 to 4 cubic feet of space. Compact washers will have up to 2.5 cubic feet of space, and super capacity front load washers can have as much as 6 cubic feet of space. Since you might not know how many cubic feet of space your load of laundry takes up, keep in mind that a washer with a capacity of 3 to 4 cubic feet can usually wash up to 12 pounds of laundry. Adjust up or down for washers with a smaller or larger capacity. Agitation: Every washing machine relies on some form of agitation to clean clothes and loosen dirt. When you peek inside the washer, you’ll find a variety of types of agitators. In a front load washer, you’ll see a big drum with small fins protruding from all sides. These low-profile paddles combined with the turning of the drum provide gentle agitation that is better for the longevity of garments. However, this gentler agitation also means longer cycle times to ensure that clothes are clean. Inside of a top load washer, the familiar sight of a tall center agitator is being increasingly replaced with an impeller plate on the bottom of the wash tub that performs a similar action while taking up less space. Typical top loaders with the tall agitator are said to shorten the longevity of garments and can hinder the ability to wash larger, bulkier items like a comforter. Cycles: While all washing machines have basic cycles to handle everyday laundry needs, some machines go above and beyond with specialized cycles for oversized items like comforters or items labeled for handwashing. Another popular option appearing on many front-loading washers and some top-loading washers is a sanitizing cycle that uses high heat to kill up to 99.9 percent of bacteria—perfect for dirty dish rags or pet bedding. Drum Material: Since your clothes are about to get washed and whirled inside of a machine, you want to be sure that nothing will snag the fabric of your favorite blouse. Stainless steel tubs are considered the smoothest and most durable choice for washing machine drums. They’re often included with higher-end washing machines. Porcelain-enameled steel tubs are also popular and cost less, but over time the porcelain finish can chip or wear away—leaving exposed steel that may rust and stain or snag clothes. Less commonly seen but sometimes used in low or mid-range machines are heavy-duty plastic wash tubs. While durable enough to last for many years, they may not be well-suited for high-speed spin cycles and they can develop rough spots that might catch clothes over time. Gas or Electric: To supply the hot air it will take to dry your clothes thoroughly, you’ll need a dryer with a heater that is fueled by natural gas or powered by electricity. Does your laundry room have a natural gas line that you can connect a dryer too? If not, you’ll need to install one if you want the efficiency of a gas dryer. A gas dryer will cost more initially—especially if you need to pay to have a gas line installed, and there may be additional fees to have a gas dryer hooked up during delivery. Still, this type of dryer is generally capable of drying clothes faster, and it may cost less to operate—depending on the cost of utilities in your area. Electric dryers don’t require a separate gas line—just plug it in and it is ready to operate. You’ll generally find that electric dryers cost about $100 less than their gas counterparts. However, they typically have longer drying times, which means greater energy usage and increased costs in the long-run. Capacity: Make sure that you have a dryer suitably sized to handle the capacity of your washing machine. If not, you’ll have a load of soggy clothes ready for drying and only be able to fit some of it in your dryer! The rule-of-thumb used to be to find a dryer with twice the cubic capacity of the washing machine, but increased efficiency in dryer performance means that you won’t need to adhere strictly to that formula. Still, if you have a washer with a cubic capacity of 3.5 to 4.5 feet, look for a dryer with at least 7 cubic feet of drying space. This will also provide enough room to dry larger items, like a queen or king-sized comforters. What Is the Best Type of Washing Machine for Me? Washers with a hinged lid on top were the mainstays of modern washing machines for decades. Available in standard or high-efficiency models, these top-load washers have an agitator that moves clothes within the stainless steel, porcelain-enameled steel, or plastic wash tub. In the past, a center agitator extended up from the base of the tub with fins that would push and pull clothes. While these center agitators can still be found on some entry-level models of top-loading washers, many models have gone to an impeller agitator. This looks more like a baseplate in the bottom center of the washer and it more gently moves clothes around in the wash basket during a cycle. While the new impeller-style agitators are gentler on clothes, some people complain that they don’t clean clothes as well. Top-loading washing machines offer the benefit of not having to bend down to load dirty laundry or unload heavy, wet clothes. This can mean less strain on your knees and back. However, keep in mind that some high-capacity top loading washers have such deep tubs that it can be hard to reach items in the very bottom of the washer after the cycle is done. Some people have even had to use a step-stool to unload their high-capacity top-loading washer. This is something to consider if you’re not very tall or don’t want the hassle or reaching deep into the washer tub. One other thing to note is that this style of washing machine tends to still leave clothes somewhat saturated with water, making longer drying times a necessity. Top-loading washing machines are generally the most affordable washing machines to buy, with some models starting below $500. The most full-featured top-loading washing machines can cost $1,200 or more and look just as sleek and modern as some front-loading machines, with a capacity to match. Washing machines with a front-loading door have become increasingly popular, thanks in part to their large capacity. Generally speaking, these washing machines have capacities of anywhere from 4 to 5 cubic feet, with many falling in the 4.5 cubic foot range and some reaching as high as 6 cubic feet. Front-loading washing machines also gained rapid popularity on the laundry scene thanks to their gentle agitation action and water savings. Instead of filling a deep washer tub with water, the front-loading style of machines use less water and mix it with detergent to form a concentrated cleaning solution that clothes are tumbled with during the wash cycle. This means less back-and-forth agitation on garments and less chance for t-shirts to take a beating. However, the water savings and more delicate garment care also mean that it takes the machine longer to wash clothes—which has been a point of frustration for many people converting from top-loading washers. Some front-loading washing machines on the market today now include accelerated wash cycles that aim to solve this pain point. One other to keep in mind is that front-washers often require more care and maintenance. To keep the drum and door seals mildew and odor-free, you’ll probably need to regularly air out the inside of the washer. This can be a hassle and may not be practical depending on where your washer is located. Still, front-loading washers are often very modern-looking and are often much-coveted among appliance buyers. The entry price for a front-loader is usually around $700, and they some models brush the $2,000 price mark. For a washer and dryer set that makes the best use of vertical space in your laundry room, opt for a stackable set. Some front-loading washers have an available stacking kit that will let you mount the matching dryer on top to free up floor space. Some stackable washers and dryers come as an attached unit, which is often called a laundry center. Things to keep in mind are the fact that stackable washers and dryers are generally smaller capacity models. If you have lighter laundry needs, this may not pose much of a problem though. The other potential drawback is the fact that the dryer’s control panel and drum will be elevated – so it could be an inconvenience to pull that last sock from the dryer or set the cycle if you aren’t very tall. The cost for a stackable washer and dryer set depends on the front-loading washer and matching dryer you select, but a typical set will cost anywhere from $1,500 to $2,000 or more. Attached units like a laundry center cost around $1,200, but these are likely to be smaller capacity and with fewer features. If you want one machine to do it all (except folding your clothes), a combination washer and dryer may be the answer. These machines resemble a front-loading washer but take the task all the way to completion. After completing a wash cycle, these machines can be set to automatically switch to dryer mode. This is a major benefit if you want a ‘set-it-and-forget-it’ washing machine that won’t require you to come over and move wet clothes into the dryer. If you’ve found a musty load of forgotten laundry in your washer more than once, this may be the perfect washer and dryer for you. These machines are also popular for people with a small laundry area that can only accommodate one machine – like an apartment or RV. It is worth mentioning, though, that the convenience of start-to-finish washing and drying comes with a long cycle. It can take several hours before a load of dirty laundry emerges clean and dry. All-in-one washers and dryers are available in ventless or vented models. Ventless models don’t require an outside exhaust, and therefore have more options of where you can use them. You’ll often find these in closets with no external exhaust or in an RV. However, ventless washer and dryer combos sometimes have clothes that retain a little dampness, even after the cycle has been completed. This may mean having to let the clothes air dry for a few minutes before putting them away. Vented washer and dryer units generally perform a more thorough drying cycle, but you will need an external vent for the unit to function properly. In general, people are not wowed by the general performance of the combination washer and dryer units. But if this is the best machine for your space or laundry routine, you can find a model that will meet the mark. Expect to pay anywhere from $800 to $1,200 for one of these machines. When shopping for a washer and dryer, you are likely to see some of the same manufacturers popping up consistently in your research. These brands have often been solving the dirtiest laundry dilemmas for years and offer a wide range of washer and dryers to fit your specific situation. Samsung: Best known as an electronics giant, it’s no surprise that the washers and dryers produced by Samsung offer plenty of features and tech integrations. It seems that the company is often pushing the bounds of the conventional washer and dryer functionality, with features like a built-in wash sink for pre-treating stains or an additional independent mini-washer—useful for delicate items or extra-small loads. Many Samsung washers and dryers are loaded with cycles and options, including steam, sanitizing, and Wi-Fi connectivity. LG: If you’re looking for sleek looks and tech integrations, LG washers and dryers are big on both. With a line-up of both top-loading and front-loading washing machines and matching dryers, LG is known for offering modern-looking machines that also have smart tech capabilities and many are high-capacity models. One thing to note though is that the reliability of the electronics on LG washers and dryers has sometimes been called into question by frustrated consumers. Still, they do make an attractive choice if you’re looking for the latest and greatest in laundry care. GE: A tried-and-true favorite, GE has been manufacturing washers and dryers for decades. They offer a wide range of models, spanning everything from basic budget appliances to more sophisticated and higher-capacity models. While the units are not as flashy or feature-driven as some of the competition, these machines address the laundry needs of a vast number of consumers. Kenmore: A popular household appliance name for years, Kenmore has recently shifted focus and is selling washers and dryers (along with other appliances) almost exclusively through Amazon. The line-up of washers and dryers includes front-loading and top-loading machines, with many that combine classic looks with up-to-the-minute features. For instance, Kenmore offers a top-loading washer that defies expectations by having 6.2 cubic feet of space —which is enough for 32 towels! Such cavernous capacities used to only be expected in front-loading machines, but Kenmore pushes the exceeds expectations with this and other models. Amana: A budget-friendly brand, Amana aims to manufacture basic washers and dryers that will meet everyday laundry needs without breaking the bank. You won’t find front-loading machines or units with lots of extra features, but these appliances often rate well for entry-level models. Once you’ve picked your washer and dryer set, you might think that your decision-making is done. But there are still a few other things to consider that could prolong the performance of your new dynamic duo or make laundry day easier. Warranties on washing machines and dryers are not particularly long-lasting. Most manufacturers only offer a basic 12-month protection policy. However, many of the major players in the game (including LG, Samsung, and Kenmore) offer an expanded warranty on washing machine motors and dryer drums—in some cases, this warranty may be as long as 10 years. Additional warranty coverage may be available through the retailer and might be something to consider if you’re investing a serious sum of money into a high-end washer and dryer set. So it might be wise to do some research on the best places to buy a washer and dryer in conjunction with what type of machine you want. When it comes to accessories, pedestals are popular for front-loading washer and dryer sets - since they will elevate the opening of the units. This reduces the strain on the back and knees as you load and unload the machines. Many pedestals offer built-in storage space, which is a convenient place to store detergent, fabric softener, and stain removers. Also available for front-loading washers and dryers are stacking kits. As mentioned earlier, this hardware will allow you to mount the dryer above the washer, saving space. If you’re purchasing an electric dryer, don’t forget to check if your outlet is a 3 or 4-prong configuration. If it’s the 4-prong variety, you may need to purchase a matching power cord for your new dryer if it’s only equipped with a 3-prong version. Finally, for WiFi-enabled appliances, don’t forget to download the manufacturer’s app for controlling the washer or dryer. These apps are generally free and will allow you to track your laundry cycle in real-time and even start or delay cycles in some models.